Ukrainian Deputy Prosecutor General Yevhen Enin has announced that the Prosecutor General's Office (PGO) of Ukraine has sent a request to Russian prosecutors for the extradition of Vadim Pogodin, one of the leaders of the self-proclaimed Donetsk People's Republic ("DPR"), who violently murdered a male teenager in Donbas three years ago. "A request has been sent to the Prosecutor General's Office of the Russian Federation today for the extradition of one of 'DPR' leaders Vadim Pogodin, who violently killed minor Stepan Chubenko in Donetsk in 2014," Enin was quoted by Ukrainian PGO press secretary Larysa Sargan on Facebook on Friday as saying. Read alsoBBC: British man jailed for Ukraine terror offenceEnin stressed that the request for the murderer's extradition does not mean the recognition of the occupation of Crimea by Russia. "Pogodin was detained and is kept in custody in temporarily occupied territory of Crimea. This is not the recognition of Crimea as Russian [territory], as international conventions and practice of courts of supranational jurisdiction stipulate states' obligation of judicial cooperation even if they are at war and occupy parts of others' territory," he said. In his words, Ukraine will do everything possible to ensure that the perpetrators of this murder face justice even if they are hiding in temporarily occupied territory. "Russian prosecutors, gentlemen, if you still have at least some conscience and honor left – do not let the killer of the child escape justice!" Enin called on the Russian prosecutors. Read alsoFSB isolates one of key witnesses in MH17 case – OSINT groupThe InformNapalm OSINT community earlier reported that Pogodin is charged with a number of serious crimes, namely torture of Ukrainian prisoners and the murder of Stepan Chubenko, a 16-year-old football player from the town of Kramatorsk. Having committed the crimes in Donbas, Pogodin fled to Crimea, where he was detained. As UNIAN reported, 16-year-old goalkeeper of the Avangard football club Stepan Chubenko has been designated as a hero of Ukraine. He was tortured and shot by "DPR" militants for his pro-Ukrainian position. He studied at Kramatorsk secondary school No. 12, he was fond of sports. Since 2014, together with friends he had participated in pro-Ukrainian rallies in Kramatorsk. The teenagers cooperated with the Ukrainian military and helped local residents during shelling by Russian-backed illegal armed groups. Risking his life, Chubenko removed the flag of the so-called "DPR" from the town's square. In June 2014, he was detained by the Russian-backed Kerch Battalion for wearing a Ukrainian yellow and blue ribbon on his backpack. He was taken to the village of Horbachevo-Mykhailivka outside Donetsk where he was shot after torture. A football tournament was established in Kramatorsk in honor of Chubenko. 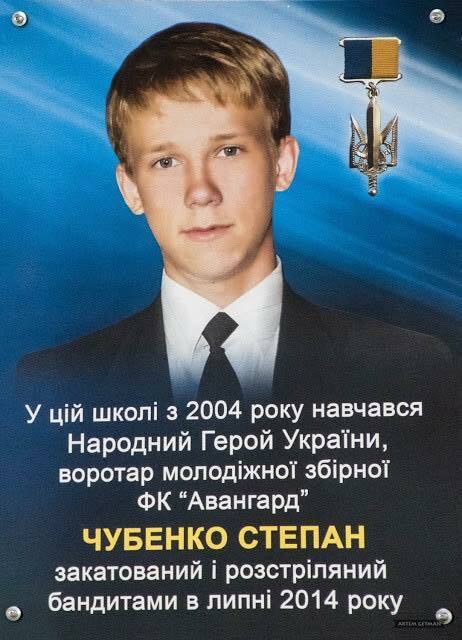 On May 8, 2016, he was posthumously awarded with a "People's Hero of Ukraine" order. On November 21, 2016, a memorial plaque to commemorate Chubenko was unveiled on the building of the school where he studied.